New edition of a classic previously published since 1987 by Penguin. Renfrew considers questions of language origins and what they imply about ethnic affiliation. He re-examines the problem of the spread of Indo-European languages and argues that early forms of these were spoken thousands of years earlier than we had previously assumed. 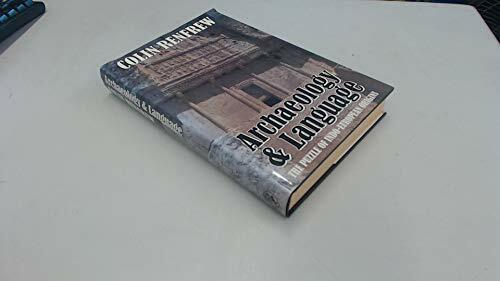 In this book Colin Renfrew directs remarkable new light on the links between archaeology and language, looking at the puzzling similarities that are apparent across the Indo-European family of ancient languages, from Anatolia and Ancient Persia, across Europe and the Indian subcontinent, to regions as remote as Sinkiang in China. He initiates an original synthesis between modern historical languages and the New Archaeology of cultural process, boldly claiming that it is time to reconsider the question of language origins and what they imply about ethnic affiliation - issues seriously discredited by the racial theorists of the 1920s and 1930s and largely neglected since. Challenging many familiar beliefs, Professor Renfrew comes to a new and persuasive conclusion: that primitive forms of the Indo-European language were spoken across Europe some thousands of years earlier than has previously been assumed. There was, in particular, no 'coming of the Celts', but rather a parallel development of some Celtic-speaking peoples in much the same areas in which they are found today. In all likelihood, as Colin Renfrew shows, the indigenous roots of the peoples of Europe lie deeper in the mists of time than anyone has ever imagined.